I have loads of these jars but from Douwe Egberts coffee, think the look so elegant on a shelf filled with buttons and bows. The etching looks so effective. That’s a great idea, I too have lots of coffee jars like this in which I keep my buttons but this would make them really special! Very pretty. I always recycle my jars too. I think it is nessercery if u r a craft person as u will have lots of things to store. Very well done on the jat. I think u can actually sell it. Love the etching. What an excellent idea. Wouldn’t those make some beautiful Christmas Gifts with different fillings. Oh I wish I could do something as nice as that. You have always good ideas my friend ! Congrats ! Endless possibilites now you know that they do etch okay. Hugs Mrs A. Your jar looks so pretty, I’ve never tried this type of etching, it looks really effective. Thanks for visiting my blog, I too love all the ghosts and bats but I’m not a fan of trick or treating. 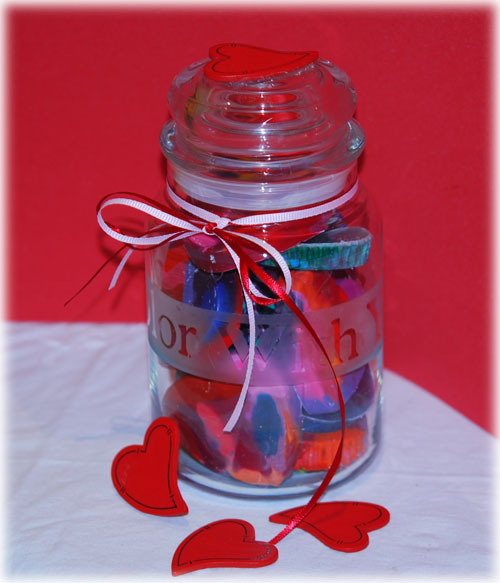 the jar looks great, and I love those little crayon hearts; did you make those too? Very good idea! I was just thinking the other day about what I could use mine for. Love the heart shaped crayons. Thanks for stopping by my blog! Have a wonderful Thursday!! oh, thats a great etching and the jar looks lovely. im a sucker for all sorts of glassy jars that can be painted, embellished and used for crafty storage. and im always on the look out for them. i, like you, also keep every candle jar. some are really cute, esp the little ones. lots of them in poundlands and other discount shops.